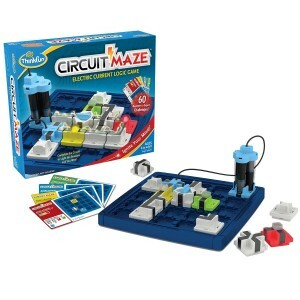 Think Fun Circuit Maze, Ignite your logic and sequential reasoning skills with Circuit Maze! Your goal is to arrange the tokens to create a real circuit that lights up the different coloured Beacons. These clever circuit-building puzzles provide a boost of brainpower and a wonderful introduction to electrical engineering. With 60 challenges ranging in difficulty from beginner to expert, this logic game will provide engineers of all levels with hours of electrifying fun. Think Fun Circuit Maze comes with Free Delivery.